The 2014 statistics from the Israeli National Council for Animal Experimentation show a 13 percent increase in animals used, reports Haaretz, an Israeli newspaper. 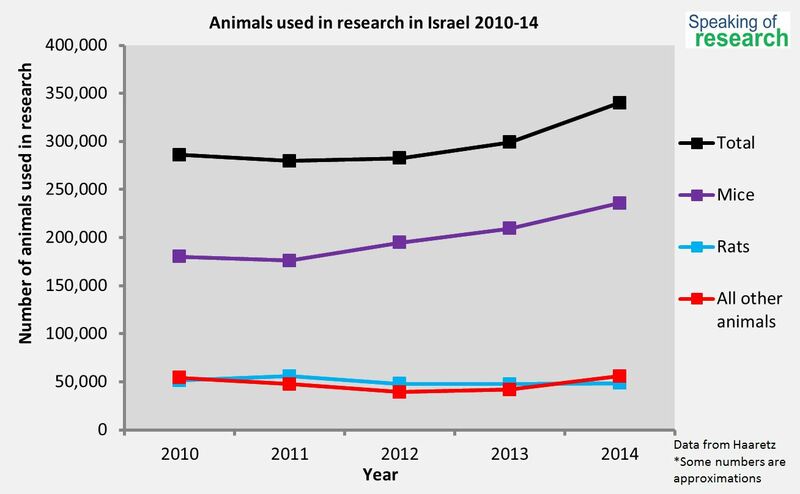 The 340,330 animals used in experimentation in 2014 represent the highest animal use since 2007, the peak of animal experimentation in Israel. Rodents comprised the majority (84 percent) of the animals used for experiments, birds and fish came next with around 7% each, while larger mammals accounted for only 1.3 percent of the total. The number of mice used, 236,000, represents a 12 percent increase over the 2013 amount. For the second year in a row, no dogs or cats were used as experimental subjects. More monkeys were used for experimentation than in previous years; however, the National Council for Animal Experimentation report notes that Israel, with a rehabilitation rate of 89 percent, ranks among the countries with the highest reintegration rates for monkeys. Seven percent of the animals were fish, which represents a three-fold increase over the previous year. The report by the National Council for Animal Experimentation attributes this increase to a concerted effort to use the lowest animal on the “developmental scale” that is scientifically appropriate. On the five point pain scale, 12 percent of experimental animals were exposed to the highest amount of pain and 19 percent were ranked in the lowest pain category. Strict supervision of the animals by veterinarians and unannounced laboratory inspections prevent unnecessary pain for the animals, The Jerusalem Post reports. Medical and scientific research were the main uses for the animals, accounting for 46 and 45 percent, respectively. Testing new products and materials used eight percent of the animals, and one percent was used for teaching. Transparent reports of animal use contribute to public education about animal research. Speaking of Research continues to report on these statistical reports as they come out, most recently the 2014 statistics for the United States and Ireland and the 2012 Canadian report. Posted on August 21, 2015 August 21, 2015 by EditorPosted in Outreach NewsTagged animal testing, israel, numbers, Statistics. Previous Previous post: Does your institution talk about its animal research?